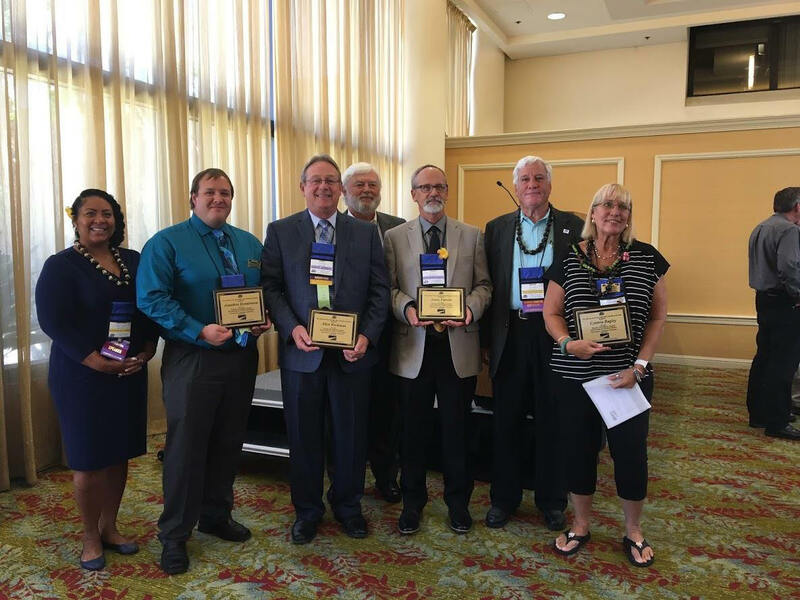 Larry Byars received MODSEA’s Distinguished Excellence in Traffic Safety Award (DETSA) in 2018. Byars has been a Farmers Insurance Agent for the past 13 years. He has served many clients in the St. Louis area throughout his career. 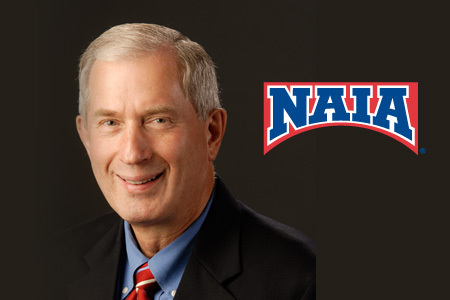 Not only has Larry faithfully served his clients, he has willingly given of his time to talk to many driver education classes in several area high schools during his tenure as a Farmers agent. Mr. Byars actively engaged students in a discussion about vehicle insurance, a topic that most new drivers aren’t overly concerned about at their age. and comprehensive coverage, Missouri’s required minimums, and the overall importance of being insured for an amount that properly protects one’s assets. Mr. Byars was instrumental in organizing a First Impact parent presentation through his agency in 2016. He has been a supporter of TyREDD. to help develop legislation that would require driver education to obtain a driver license. 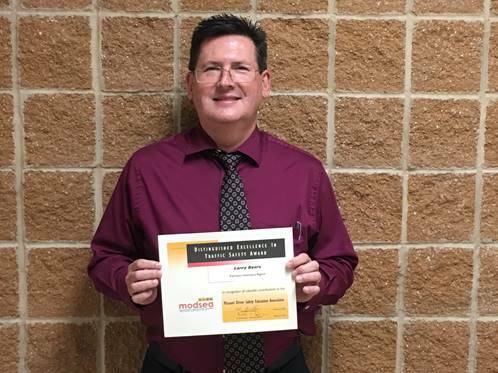 Larry’s willingness to share his insurance knowledge with area driver education classes will be missed as he is embarking on a career change with Edward Jones as a Financial Advisor. 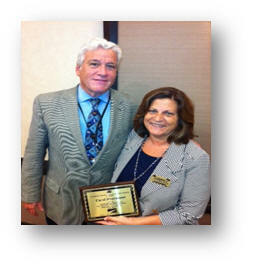 MODSEA would like to thank you for your contributions to the field of driver and traffic safety education. Congratulations to the 2017 TEA Award Winners. The Teacher of Excellence Award attracted 4 excellent candidates who met or exceeded the expectations of this award. The following teachers will be recognized at this year’s conference during the TEA Luncheon and be given the opportunity to provide a few remarks when they are called forward to receive their award. The teachers are Allyn Workman (Missouri), Jonathon Dondoneau (North Dakota), Larry Fairclo (Oregon) and Cynthia Bagley (Hawaii). Each submitted portfolios of evidence to demonstrate their qualifications for becoming a TEA recipient for this year’s conference. After reviewing each portfolio, it was determined that all should be awarded the TEA for the 2017. The TEA committee would like to take this opportunity to thank the National Road Safety Foundation for their continued support of this excellent award. Each awardee received from the National Road Safety Foundation a monetary stipend, their conference registration waived, a name badge indicating their selection as a Teacher of Excellence award winner, and a plaque with their name and recognition as an ADTSEA Teacher of Excellence Award recipient. 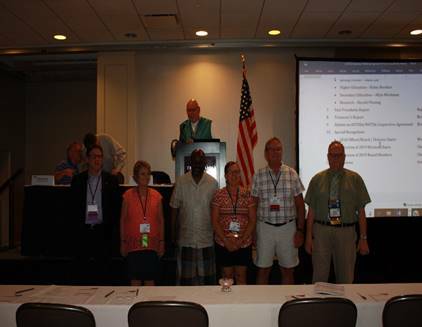 In picture from left to right: Michelle Anderson, NRSF, Jonathon Dondoneau (North Dakota), Allyn Workman (Missouri), Rich Hanson, TEA Coordinator, Larry Fairclo (Oregon), David Reich, Reich Communications and Cynthia Bagley (Hawaii). 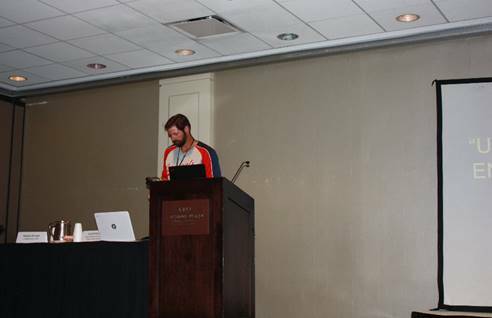 Rob Droege (Lindbergh High School) presented at the national American Driver and Traffic Safety Education Association (ADTSEA) national conference held in Chicago, July 22 – 25, 2018. His presentation, “Using Technology to Engage the Driver Education Classroom”, was well received by those in attendance. and as the Division Chair for the Secondary Division program for the national ADTSEA Conference. 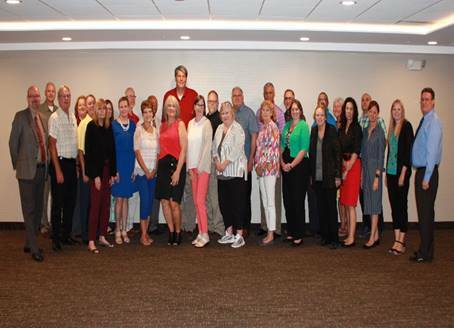 Workman, along with Janice Rehak (Department of Elementary and Secondary Education) also represented Missouri at the Association of National Stakeholders in Traffic Safety Education (ANSTSE) conference July 20 – 21, 2018 in Chicago, IL. Carol Hoormann was one of three driver education instructors from across the United States recognized with the Teacher Excellence Award (TEA) on July 15, 2014 at the national American Driver Traffic Safety Education Association (ADTSEA) conference held in Wichita, KS. Hoormann is active in the driver education community as she works to improve driver safety. She serves on committees for the Missouri Department of Transportation which works to reduce highway fatalities and increase traffic safety education in the St. Louis area and on the safety and education committee for Monsanto. Carol sponsors the Teen Safe Driving organization at Lindbergh High School. Hoormann is married to Kevin and they have two children. In her spare time she likes to bowl and golf. David Reich of NRSF presenting the TEA award to Carol Hoormann. 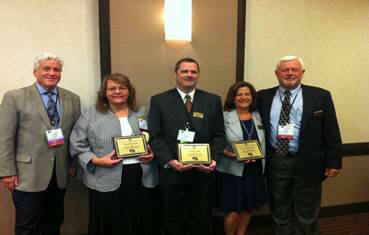 David Reich of NRSF, Bea Kehr (MN), John Viau (VT), Carol Hoormann (MO), and Rich Hanson ADTSEA TEA Co-Chair.